Jointly funded by ARRA (American Recovery and Reinvestment Act) appropriations to the EAR and OCE divisions of the National Science Foundation, the Cascadia Initiative seeks to better understand subduction dynamics in the Pacific Northwest. This objective includes studying the deformation and hydration of the Juan De Fuca plate, seismicity of the Cascade megathrust, and structure of the Cascade volcanic arc. The Juan De Fuca plate subducts beneath North American at 4-5 cm/year, forming an active ocean-continent subduction zone spanning from Vancouver Island to northern California. Paleoseismic observations indicate a major megathrust earthquake in Cascadia region in 1700. The largest earthquakes in recorded history have occured on subduction megathrust faults, and the recent destructive earthquakes in Indonesia, Chile, and Japan have increased the motivation study Cascadia. The aim of the Cascadia Initiative is to deploy a large array of onshore seismometers operated by IRIS, offshore seismometers from the OBSIP, and real-time geodetic instruments deployed as part of the UNAVCO Plate Boundary Observatory. Geodetic measurements include position, tilt, and strain of the crust produced by GPS sensors and borehole strainmeters. The onland seismic deployment includes the reoccupation of 27 EarthScope USArray Transportable Array stations across Cascadia. For more about seismological measurements produced by the USArray TA, click here. For more on the amphibious OBSIP offshore component click here. EarthScope's Transportable Array has operated since 2004 and already produced valuable seismic observations in the Pacific Northwest. 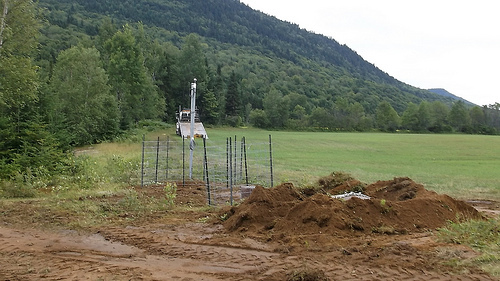 Click here to see how a transportable seismic station works. Other contributing networks to the Cascadia seismic dataset include the Berkeley Seismic Network, University of Oregon Regional Network, Pacific Northwest Regional Seismic Network, Global Seismic Network, and US National Seismic Network. The unique pairing of simultaneous onshore and offshore deployments will dramatically improve the ability to image the Cascadia region. The Ocean Bottom Seismograph Instrument Pool provides OBS instrumentation used in the Cascadia Initiative Project. OBSIP Maintains a Cascadia Project Page that provides additional information about the OBS portion of the project and also provides access to the instrument horizontal orientations. Cascadia OBS Data is available from the IRIS DMC via the 7D network and _CASCADIA virtual network. The Cascadia Initiative Expedition Team provides community planning and project leadership.